This is one interesting ad. Smoking was once considered healthy. It was an activity of the socially hip crowd. It was even sexual. This is despite more than ample evidence that there is a strong relationship between smoking and impotence. Nevertheless, in the early 20th Century smoking and even blowing smoke in one’s face was a sexual signal. This was played out in both film and advertising as you see in the ad below. The woman’s mouth is slightly open, she is leaning in to reveal some cleavage, she looks drawn to the smoke as if it is a rope tying her to the man who is pulling her in to his body. Put this way, the ad sounds like a cheesy Harelequin romance. But this is exactly what it wants to be. Right down to the little phallic tip of the cigar. 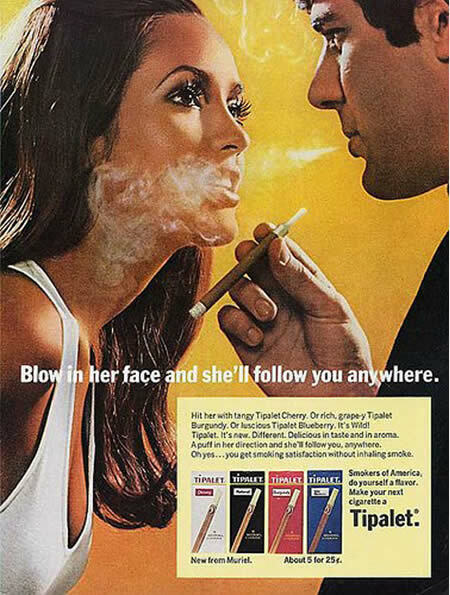 That satisfaction in the text at the bottom is not about the smoking but the ability of a man to control a woman for his own sexual pleasure. Among youth, I wonder if there is still a sort of latent sexualization of smoking. There is certainly an air of adulthood or even maturity in the act. Social conditions and being around smoking is a cause as are other social behaviors and beliefs. For example, if parents smoke, their kids are likely to start. This is also a factor among peer groups. We tend to adopt the behaviors of our peers. Alcohol, eating habits, exercise, the movies we watch and others all are related to the communities of which we are a part. The flip side is that if we want to break a habit or behavior, spending more time with those who do not exhibit these behaviors is a critical support. Recovering addicts, for example are told not to spend time with their old crowd of addicts and suppliers. Doing so is a near guarantee for relapse. Watch kids smoking together today. When you see this what does it look like? I would really like to hear about your observations!